April | 2012 | "A Stitch in Time"
But first of course is the drive to Echo’s follow up appointment one month after her surgery (her SUCCESSFUL surgery). We got up rather early, packed our NEW van up and headed out SUCCESSFULLY… we even went over 80km an hour! We are no longer a bad reverse version of the movie Speed! YAY! We had to drive with our temporary travel sticker as we were heading right to register permanently and get our new licence plate AFTER her 9:45 appointment. We made rather good time and parked in the parkade this time to save on walking. Then it was right in to the cardiology clinic to sit and wait. 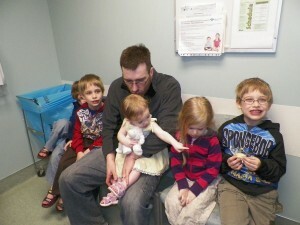 Ken actually took the big kids to the toy area right outside the clinic and I did all the tests with Echo. 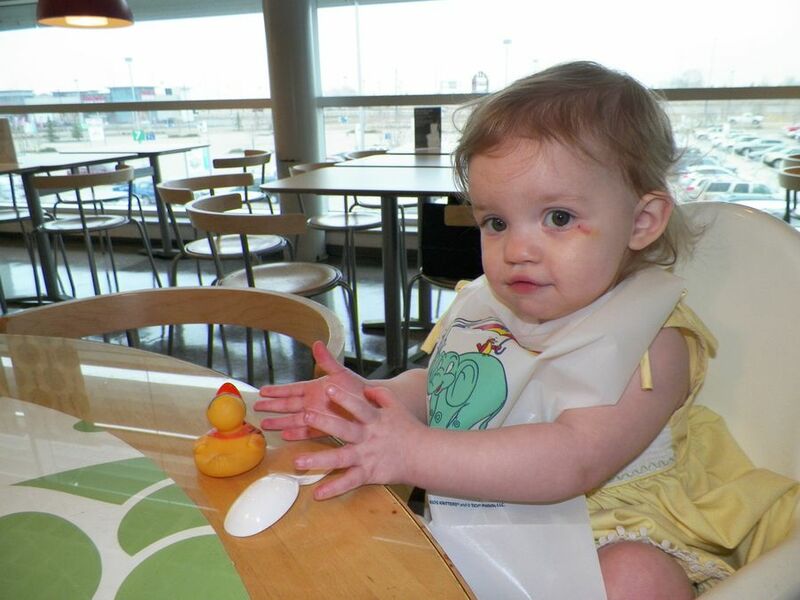 They were mostly worried about doing her Echo-cardiograph and did that first. She was NOT impressed but they were able to show me the device with the heart beating around it. Nothing moving where it shouldn’t, it was rather amazing! They weighed and measured her as well and it turns out she has gained almost a POUND since surgery. So good for her! And we were able to get her EKG done too… though blood pressure never really came out right. Then there was just the wait to see the cardiologist who was VERY happy with her progress and glad to see all of the kids together. We had also brought in our thank you card which made its rounds and was VERY well received! Waiting for the cardiologist... note the obvious boredom! Of course Echo wanted to walk out of the hospital and tripped and fell face first in front of some nurses and the kids were bored out of their minds but we were ok! I am so glad we do not have to go back for 5 months! Pre trip and fall but cute group! After hospital it was time for a wee bit of shopping – and lunch… well both stores were in the same place so first we went to Education Station to redeem Trinity’s birthday 10.00 gift certificate. She also had birthday money to spend from Nana and Baba so there was some excitement to be had! She decided on a jewelry box you decorate yourself with jewels. A great choice as she keeps getting tiny pretties to save and has no good place to put them. 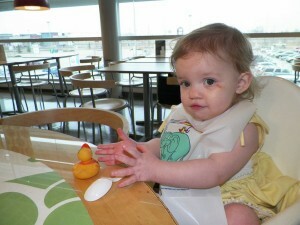 And then, of course… lunch at “the Meatball Store” AKA IKEA for those less in the know! 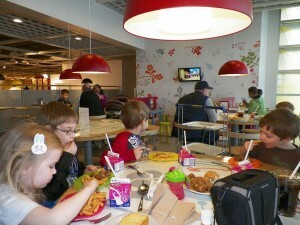 We had to get our fill of meatballs while the kids watched some of Mulan on their tv in the kids’ area. VERY delicious AND affordable! One of the things we miss from moving out of the city. Then Trinity and I wandered the toy section to spend the last of her birthday money. 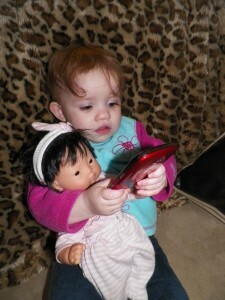 She managed to get a dolly, dolly clothes and a cute soft bathtub set. 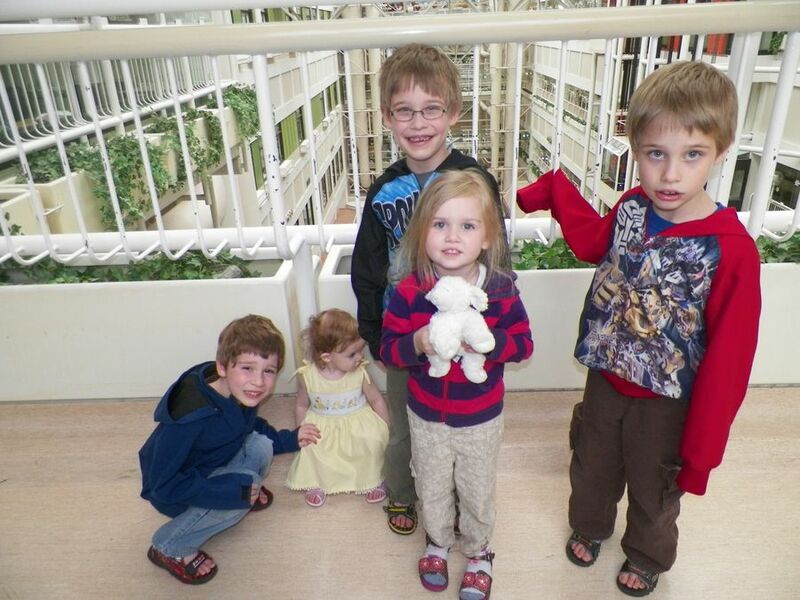 With the shopping and eating and hospital stuff done it was time to head out to our next destination – the registration office, then Grandma’s work and then to Sharon and Darryl’s for our two night stay to visit with them and their 3 kids Emma, Ethan and Logan. They are back home from California and the kids are all around our kids’ ages. So it works PERFECTLY… oh and Echo LOVES Sharon. We continued on the hour south east and went right to the registry. With minimum fuss (Ken had to come back out to get cash since he couldn’t use his card there) we had our licence plate and then it was just a matter of stopping in to see Grandma and borrowing her washroom… and a screwdriver! And then we were official… New Used Van is ours! What a success! The rest of the evening it was time to catch up with the Bleau family. 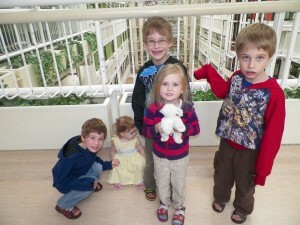 The kids were in toy and friend heaven… we had play time, some yummy dinner and then ADULT time! Ken and Darryl did some gaming and Sharon and I hung out while she made a cake just to celebrate Trinity’s birthday! It was a lovely and RELAXING evening. The kids had a bedroom to sleep in – two large bunkbeds and a pull out bed that we didn’t use. It made me VERY tempted to start trying to convince Ken that we needed to move back to town… almost. The small town feel and the ability to still do most everything combined makes it so comforting. Ken just rolled his eyes at me. So that is the Wednesday… onto our second day in town and the relaxation that followed in the NEXT blog entry. After all, we stayed in ONE PLACE with toys, kids and friends for a whole day! Gotta share that right… and who’s birthday did we celebrate? Can you hear Trinity yell TRINITY??? We have been super busy this week but I have good news on Echo – she is 100% healthy! and the van – it runs! 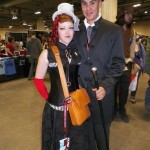 and a picture… we are at comic con!!!! 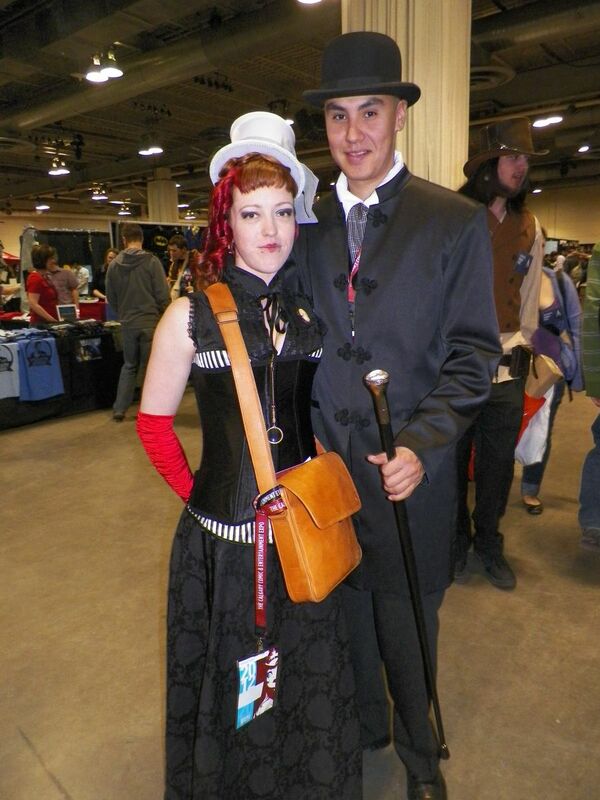 I have to share these costumes, they were nice enough to pose for me. Even with all the chaos and frustration we are keeping up with our studies. 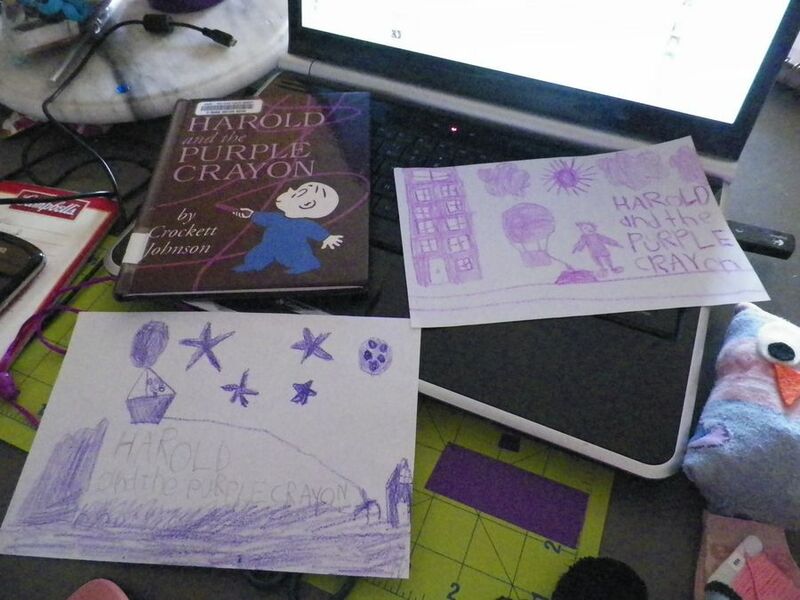 Yesterday the kids and I read Harold and the Purple Crayon. Then the twins drew a picture using one crayon colour like Harold does. (Trinity and Emanuel went off the garden path and simply were creative) There is a series based on the book on Netflix so during some of their not outside in the sunshine time they watched that as well. 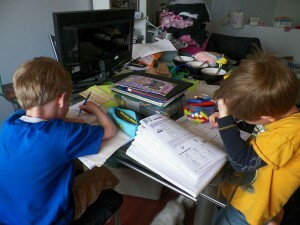 We have been at work with our math some more as well, though somewhat grudgingly. I am a little concerned about how they are going to react once we get settled and organized and REALLY have to push into our learning. We have accomplished an awful lot though, both boys are reading much more fluently… writing better… thinking on their own with much better results and the progress in math is very positive! We are continuing with Farmer Boy chapter by chapter. I have also printed out some lapbook mini books to do up when we have some time. The main focus is on reading the story and comprehending what happened in the chapters. This is our first long chapter story and the boys’ attention is a little variable but we are getting through it bit by bit. I have found a couple of educational apps for the kids that are going over REALLY well! First off is a favourite of Trinity’s called Old McDonald’s Farm. She loves spinning the wheel. And then there is the one that Gavin loves Kiko. He has far surpassed my ability on there. Echo’s favourite has to be Meet Biscuit. A new favourite for the kids that I recently loaded up is Edge. 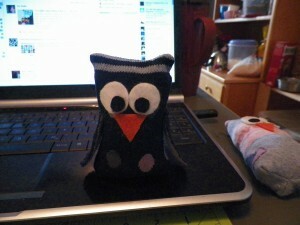 I have been creating more and more sock owls lately… I have bodies ready for features and wings just waiting for me. I did, however, finish one today. Which I think turned out rather cute! As of tonight the van saga has reached its peak with the purchase of… A VAN! We still need to do permanent registration and all that after Echo’s follow up appointment (and are leaving for the city super early in case of police pulling us over – you put the transport sticker in the window but that may not be noticeable enough in the morning after all! But it is a huge thing off our list! That means we now have transportation to the doctor tomorrow AND then onto friend’s for two nights… then Comic Con! My first ever! Then… well Sunday night will take some figuring out and we still have to check in one last time with the owner of the new rental regarding the 1st BUT tonight it is YAY van time! Thanks to Karyn that is! That leaves me with tonight to collect enough stuff for the next half week. Clothing and probably some school supplies for Thursday. Friday the boys are so excited – they get time with our nephew! It has been a while! I am going to spend the rest of the week focused on the moment… we get to go and show everyone how well our Echo has been doing and give the hospital our thank you card. The kids worked rather hard on it and are very proud to be able to give it to them. I added in a picture of Echo and wrote a little thank you. I hope they like it. 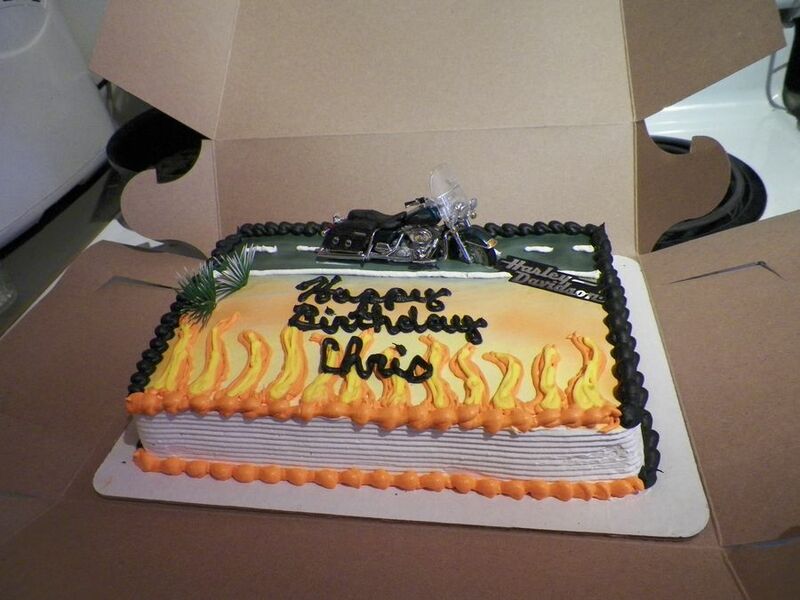 Today was a bit of a special day – it was She Chris’ birthday! 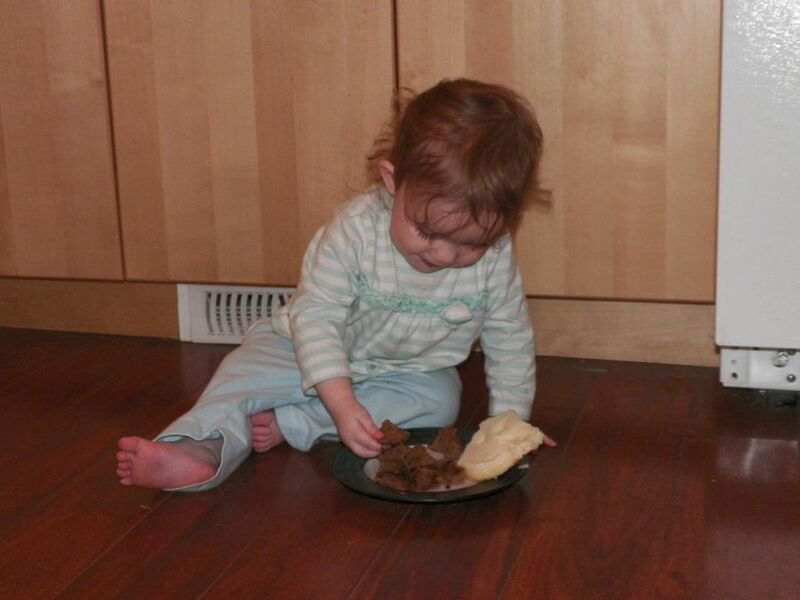 We had homemade hamburgers and CAKE! Harley Davidson cake. Total noms. I made her a change purse and hair thing out of the cupcake duct tape. With Ken getting a HAIRCUT… a van… and then a birthday girl in the house… today can be categorized as a GOOD day!